In 1992 we formed Sawatzky's Imagination Corporation. Our projects had gotten much bigger and more complex. It was time to grow even more. In the spring of 1995 we got a call from West Edmonton Mall. It would turn out to be the opportunity of a lifetime. But first we would have to prove ourselves. Our first project was for a small kids play park in the indoor amusement park. We had only 30 days to do the largest job we had ever tackled. Janis stayed home to watch things there while I traveled 1000 miles from home to start this new exciting project. The theme was space - but with a colorful cartoon bent - right up my alley. I worked hard, hiring a laborer on a part time basis to help. Janis came out the last week as the deadline approached and the job got ever larger as they added to our work. We made the deadline with minutes to spare but didn't sleep the last three days as we worked around the clock. It was a few months before we returned. 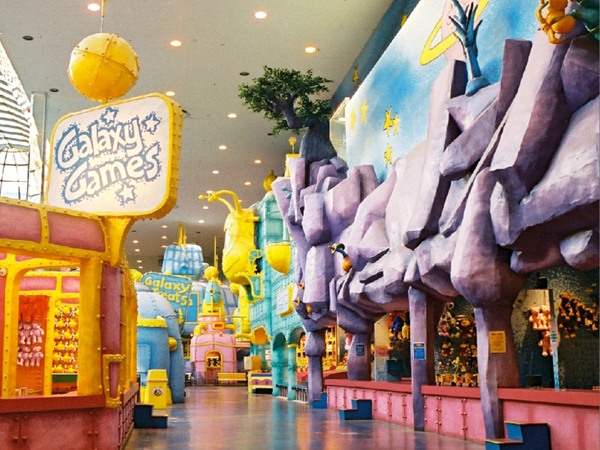 The owners at West Edmonton Mall had loved our first job so much we were named the official contractor to theme the entire five acre indoor theme park, now called GALAXYLAND. THere was no master plan, nor were we signed up for more than a few months at a time. The massive job would be done on a project by project basis, designing as we went. Our mandate was to put a new face on the entire theme park without shutting any ride down for more than a day at a time. We started the job with a crew of five. As the jobs got bigger we added crew members eventually numbering 22 in all. We worked hard through each day, starting early before the park opened with the dangerous jobs like welding and the big lifts. When the park opened half way through our work hours we stuck to sculpting with concrete and painting. Our happy and energetic crew was considered part of the entertainment by the mall management. We worked behind low, portable fences to keep the public safe. We worked in every area of the theme park but also through the world's largest mall as well. Through those five busy years when we were there on a full time basis we also did work by the skating rink, the aquarium attraction, the submarine ride, the minature golf and in the retail areas. Building what I imagined at last!